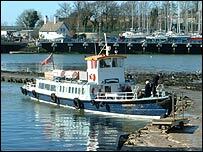 The history of a ferry which has linked Devon to Cornwall for centuries is being explored at a special event. The Cremyll Ferry takes foot passengers from Stonehouse in Plymouth to the eastern end of the Mount Edgcumbe Country Park. Plymouth City Council is asking local people to come and share their memories of the crossing at St Paul's Church in the city on Saturday from 1030 BST. Plans for a £1.4m improvement project at Cremyll will also be on show. The crossing is thought to have originated in Saxon times and was first documented in 1204. Stonehouse historian Bruce Firth will lead two guided walks exploring the waterfront between the Royal William Yard and Admiral's Hard, highlighting the Cremyll connection. "It should be a really interesting event," said city councillor Chris Mavin.